I want to begin by thanking everyone for last Sunday's beautiful high mass and reception for the choir. Many commented on how they enjoyed the Eucharistic procession and Service of Benediction in the garden following high mass. Thank you to the acolytes who came for an additional practice last Saturday, thank you to the choir for leading the singing in the garden, thank you to the ushers who did many tasks in the background, and thank you to our hospitality ministry for the post-mass reception. One of the realities of Honolulu is that there are many Episcopal churches. Just within a few miles of St. Mark's, there are five other Episcopal churches, and this does not include the Episcopal churches downtown. If we used business terminology, we could say that the market is over-saturated with Episcopal churches, and this would be especially true if all of our churches were the same. Thankfully, we are not all the same, and compared to the others, we are fortunate that St. Mark's is quite unique. Even though many of our members live in the nearby neighborhoods of Kapahulu, Diamond Head, Kahala, Palolo Valley, and Waikiki, many of our members come from Aiea, Kailua, Kaneohe, and beyond. We are a neighborhood church, and we are a destination church. Many are willing to drive a good distance every week because of our worship and our people. This coming Sunday we will celebrate the Feast of Saints Peter and Paul. In the Roman Church the day is considered a solemnity, the highest rank of a feast. Our prayer book lists it as part of the "Other Major Feasts." In the Anglican Missal a set of propers (readings and prayers) were included for both the eve and the day. It is one of the oldest feast days of the church, commemorating the martyrdom of both apostles. Tradition maintains that Peter was crucifed upside down, and Paul, being a Roman citizen, was beheaded. Even though we often think of how these two apostles had their disagreements, the church has sought to show their unity in Christ, and this unity is best demonstrated by the fact that both were willing to die for their faith in Jesus Christ. 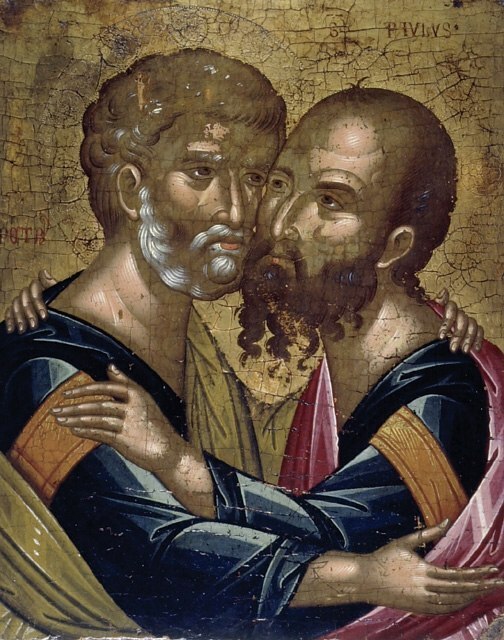 Iconography typically shows these two apostles in a holy embrace, and some liturgical traditions stipulate that one never celebrates a mass for one of these apostles, without celebrating a mass for the other apostle. Hence they share this day in the calendar for their martyrdom. They also share the Week of Prayer for Christian Unity in January; the Confession of St. Peter opens the week, and the Conversion of St. Paul ends the week. Sometimes Anglicans are uncomfortable with the Feast of Saints Peter and Paul. It seems too Roman to some. It is important that we not allow centuries of denominational conflict between Roman Catholics and Anglicans to diminish our thanksgiving for Paul and Peter. Both willingly died for their faith in Jesus Christ, and for this we show honor and respect.